What are the roles of deep Precambrian basement deformation zones in the localization of subsequent shallow-crustal deformation zones and magmas? The Paleoproterozoic Great Falls tectonic zone and its included Boulder batholith (Montana, United States) provide an opportunity to examine the importance of inherited deformation fabrics in batholith emplacement and the localization of magmatic-hydrothermal mineral deposits. Northeast-trending deformation fabrics predominate in the Great Falls tectonic zone, which formed during the suturing of Paleoproterozoic and Archean cratonic masses approximately 1,800 mega-annum (Ma). Subsequent Mesoproterozoic to Neoproterozoic deformation fabrics trend northwest. Following Paleozoic through Early Cretaceous sedimentation, a Late Cretaceous fold-and-thrust belt with associated strike-slip faulting developed across the region, wherein some Proterozoic faults localized thrust faulting, while others were reactivated as strike-slip faults. The 81- to 76-Ma Boulder batholith was emplaced along the reactivated central Paleoproterozoic suture in the Great Falls tectonic zone. Early-stage Boulder batholith plutons were emplaced concurrent with east-directed thrust faulting and localized primarily by northwest-trending strike-slip and related faults. The late-stage Butte Quartz Monzonite pluton was localized in a northeast-trending pull-apart structure that formed behind the active thrust front and is axially symmetric across the underlying northeast-striking Paleoproterozoic fault zone, interpreted as a crustal suture. The modeling of potential-field geophysical data indicates that pull-apart–stage magmas fed into the structure through two funnel-shaped zones beneath the batholith. Renewed magmatic activity in the southern feeder from 66 to 64 Ma led to the formation of two small porphyry-style copper-molybdenum deposits and ensuing world-class polymetallic copper- and silver-bearing veins in the Butte mining district. Vein orientations parallel joints in the Butte Quartz Monzonite that, in turn, mimic Precambrian deformation fabrics found outside the district. The faults controlling the Butte veins are interpreted to have formed through activation under shear of preexisting northeast-striking joints as master faults from which splay faults formed along generally east-west and northwest joint plane orientations. 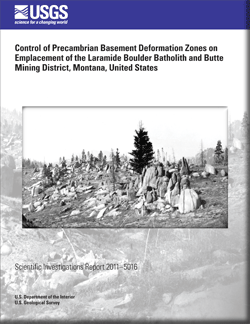 Berger, Byron R., Hildenbrand, Thomas G., and O’Neill, J. Michael, 2011, Control of Precambrian basement deformation zones on emplacement of the Laramide Boulder batholith and Butte mining district, Montana, United States: U.S. Geological Survey Scientific Investigations Report 2011–5016, 29 p.